1Depatment of Sociology and Center for Integrative and Development Studies, University of the Philippines, Diliman, Quezon City, Philippines. The eruption of Mount Pinatubo and subsequent widespread and persistent lahars and flooding have taken a serious toll on the people of central Luzon. The most serious toll has been the displacement of more than 10,000 families (more than 50,000 persons) whose houses were destroyed and whose farmland or other source of livelihood was buried. Initially, the indigenous Ayta people were hardest hit, and many remain displaced from their livelihood and their cultural roots. Since the eruption, many lowlanders have also become evacuees, driven from their homes and land by lahars and floods. Evacuations and damage from the volcano have undermined preeruption social standing and community leadership. Psychological stress is high. Decisions about how to mitigate lahar hazard have provoked suspicions between neighboring communities. Decisions about how to organize resettlement areas have engendered lively debate and, among some, concern that well-intended humanitarian relief is becoming a substitute for self-sufficiency. Viable resettlement options are badly needed, in which provisions for livelihood and social stability are given even more attention than matters of housing and visible public infrastructure. Since its major eruptions of June 12-15, 1991, Mount Pinatubo has changed the landscape of central Luzon, uprooted thousands of residents from their homes and means of livelihood, and affected the agenda not only of the local, regional, and national governments but also of nongovernment organizations. This paper aims to provide an overview of the social and psychological impact of the volcanic eruption and some of the issues and problems of resettlement. The discussion is based on several sources: documents of the now-defunct Mount Pinatubo Task Force and the Mount Pinatubo Resettlement and Development Commission, which was created by law in September 1992 to replace the task force; unpublished reports of the regional government agencies, specifically the National Economic Development Authority, the Department of Public Works and Highways, the Department of Agriculture, the Department of Agrarian Reform, and the Department of Social Welfare and Development; relevant clippings of all major newspapers from June 1, 1991, to December 31, 1992; papers read in scientific conferences and various forums; findings of ongoing studies; and other published materials on the Mount Pinatubo disaster. Apart from written documents, the paper relies heavily on interviews with key informants in government and nongovernment institutions and discussions with victims in evacuation centers and resettlement sites. Some of the points in this overview first arose in a field-based multidisciplinary study of one municipality, Concepcion, Tarlac, which is located in the direct path of lahars (fig. 1) (C.B. Bautista, 1993). Our team of social scientists lived in the area for 3 months, from October to December 1991. The team's findings were later validated or qualified by key informants in other areas of central Luzon. In February 1992, a workshop involving researchers and key resource persons in the municipality was organized. A month later, some of the research findings were disseminated in a town assembly held on March 27, 1992. Figure 1. Locations of barangays, towns, cities, and provinces cited in this report. 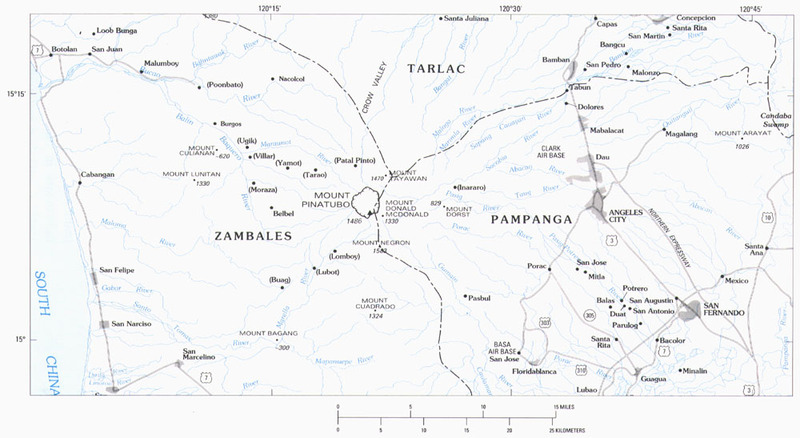 All of the barangays and smaller sitios that are shown in parentheses, except Poonbato, were destroyed by the eruption. Poonbato was destroyed by subsequent lahars. Some of the team members went to Concepcion at regular intervals thereafter--twice a month from April to July 1992, about once a week from August to September, and biweekly in October and November to follow up developments there. While data were updated in Concepcion, another small research project was organized from October to December 1992 to gather information on the disaster in central Luzon. Devastated villages, resettlement sites, and evacuation centers were visited. Interviews with respondents in government agencies and discussions with victims and their care-givers were conducted within this time period. The 1991 eruption of Mount Pinatubo and its muddy aftermath have affected hundreds of thousands of central Luzon's residents in varying degrees, depending upon the specific hazard and their physical vulnerability to it. For purposes of accuracy in assessing the social and psychological impact of Mount Pinatubo on the population, the effects of the volcanic eruption are discussed separately from the effects of lahars and floods. Ash fall from Mount Pinatubo's eruptions in June 1991 affected about a million people, half of whom were from the province of Pampanga (table 1) (Pardo de Tavera, 1992). A quarter of a million people remained displaced 1 week after the first major blasts, of whom about 3 percent were in formally organized evacuation camps (Department of Social Welfare and Development, unpub. disaster monitoring report, September 28, 1991). Tens of thousands of central Luzon residents fled to Metro Manila, and about 30,000 of these took refuge in the Amoranto Stadium in Quezon City. Though generally harmless in areas far from Mount Pinatubo, wet ash fall from 5 to 50 cm deep caused 189 deaths in areas near the volcano when roofs collapsed under its weight (Magboo and others, 1992; Spence and others, this volume). Ash fall also damaged public structures that housed social services. Ninety-eight hospitals and health centers, 18 public markets, 13 municipal buildings, and 70 other government buildings were destroyed (Department of Public Works and Highways, 1992a). Of all persons affected, the hardest hit were the Aytas, an indigenous tribe (Shimizu, 1989). Around 7,800 Ayta families, or 35,000 persons, were forced to flee their homes (Task Force Pinatubo, 1992). The Ayta's economic and cultural life before the eruption was rooted in Mount Pinatubo. They lived by the volcano's rhythm, timing the planting and harvesting of their crops by the volume of steam rising continuously from a natural vent on the upper slope. A relatively dense steam meant a good harvest; a thin one augured a sparse yield (Lubos na Alyansa ng mga Katutubong Ayta ng Sambales (Negrito People's Alliance of Zambales, LAKAS), 1991, p. 32). They hunted in the volcano's wooded slopes and fished in the rivers that drained it. The volcano was not only the source of the Ayta's livelihood but also the abode of Apo Namalyari, their God, and home to the spirits of their ancestors. For these reasons, the Ayta's evacuation from the volcano was especially disruptive and heart-rending. A vivid chronicle of their life and exodus is given in Eruption and Exodus (LAKAS, 1991). From that book's account, earth tremors and heavy steam from the volcano summit at 1600 on April 2, l991, caused panic-stricken Aytas from villages along the Zambales mountain slopes to flee their homes and converge in a village 12 km from the volcano's base. Those who ignored the first ominous signs on April 2 fled in waves within the next 2 weeks. By the third week of April, the number of evacuees in Poonbato, Botolan, Zambales, reached about 4,000. Even Poonbato was not the last stop of the Aytas documented in the book. They changed sites with each extension of the danger zone from a 10- to 20-km radius of the volcano, from 20 to 30 km, and finally from 30 to 40 km. Some groups moved 9 times in 1991 before they found semipermanent relocation sites. Fortunately for the Poonbato Aytas, whose experience was documented, the group was kept intact throughout the exodus. As organized constituents of the Lubos na Alyansa ng mga Katutubong Ayta ng Sambales (LAKAS), they were also in a better position to maintain their cultural and tribal bonds and to critically assess the options opened to them. The acronym of the federation, LAKAS, means power. This was not the case, however, among the Aytas living on other parts of the volcano. Mount Pinatubo's eruption scattered them to various evacuation centers and disrupted their political and administrative structure. New leaders and factions began to emerge as the tribes separated (Tadem and Bautista, 1993). Anticipating the need for Aytas to vacate the slopes of Mount Pinatubo, the government set evacuation procedures in place before the major eruptions in June 1991. Conditions in the evacuation sites, however, were extremely difficult for Aytas. The tents provided only minimal shelter from the elements. Evacuees suffered from extremely hot days and cold and damp nights in these tents. There was no basic sanitation. As a consequence, respiratory and gastro-intestinal ailments were common. In early August, the Department of Social Welfare and Development reported that 156 Ayta children had died in evacuation centers in Tarlac and Zambales from various diseases such as measles, bronchopneumonia, and diarrhea. Cultural differences accounted for the spread of some of these diseases. The measles outbreak is a case in point. A study conducted by the Department of Health reveals that its immunization campaign did not reach all vulnerable children in the camps. The cultural gap between the Aytas and health workers prevented the latter from reaching Ayta children (Magpantay and others, 1992; Surmieda and others, 1992). Some health workers believed that the Aytas eschewed Western medicine in favor of their own. However, the Sisters of the Franciscan Missionaries of Mary, who pioneered the literacy campaign among Aytas in Poonbato, claim that Aytas generally know when to ask for Western medical help. What was missing, at least initially, was rapport between health workers and Ayta evacuees that was based on an understanding of the Ayta culture. Malnutrition also contributed to high mortality among Ayta children (Surmieda and others, 1992). Aside from getting more sick than their lowland counterparts in evacuation centers, Aytas were also disoriented by the surroundings far from their upland homes. They were unaccustomed to the sight of flatlands and plains, and they longed to roam the mountains and hills again in communion with nature and their God (LAKAS, 1991). Thus, the Aytas were the prime victims of the volcanic eruption itself, before secondary effects like lahars and floods were taken into account. They were evacuated earlier than any other group, and throughout the ordeal of moving from one evacuation site to another, they were totally uprooted from their way of life. Even their resettlement sites, with high population density and town plaza complexes, were alien to their preeruption existence. The major eruptions and the plight of the Aytas in evacuation centers dominated newspaper headlines in June 1991. Since that time, lahars and floods have devastated many more villages and towns. Because preeruption river channels have been clogged by lahars, subsequent rainfall cannot drain away through those channels, so it floods adjoining lowlands. By October 1992, most parts of 29 barangays (villages) had been buried by lahars to depths of several meters (table 2). Eleven of these were in only one municipality--Botolan, Zambales. Six were in Tarlac and 12 in the densely populated province of Pampanga. Half of Pampanga's abandoned barangays were in the municipality of Bacolor. The 29 severely affected barangays were home to almost 10,000 families, or about 53,000 people (1990 National Statistical Office population estimates for these 29 barangays, as stored in the National Economic Development Authority Region III Geographic Information System data base). Even this high number is surely an underestimate, because it counts only those in barangays within which most sitios (hamlets) were buried. Families from devastated sitios of relatively less affected barangays are not counted. Most of these families once lived in the densely populated barangays of Pampanga, the province that bore the brunt of lahars in the first 2 years. Porac, one of the most severely affected of central Luzon's once bustling towns, symbolizes Pampanga's travails. Many of its residents have left. Floods caused by silted waterways have added to the misery of central Luzon's lowland victims. Compared to 1991, 1992 was the year of floods. Siltation of river channels (much by lahars) caused subsequent floods that submerged barangays in at least 18 municipalities (table 3). As of October 1, water from the September monsoon rains had not yet subsided in low-lying parts of these municipalities, and additional barangays (especially in Zambales) were also isolated by floods at this time. In the province of Bataan, adjoining the Pinatubo area, the municipalities of Dinalupihan, Hermosa, and Orani experienced persistent floods in 1992. Newspaper accounts on the week of August 20, 1992, cite the evacuation of residents of Hermosa from floodwaters of up to 5 to 7 feet (Philippine Daily Inquirer, August 20, 1992). Table 2. Lahar-devastated barangays that were virtually abandoned in October 1992, listed by municipality and province. Owing perhaps to the previous year's experience with lahars, there were very few deaths due to lahars and floods in 1992. Whereas 100 of the 932 disaster-related deaths in 1991 were due to lahars, fewer than 10 died from lahars during 1992 (1991 figures are from the Special Transition Report of Task Force Pinatubo, May 1992, and include deaths from illness in evacuation camps; 1992 data are from the Department of Social Welfare and Development Region III Disaster Monitoring Report, September 28, 1992). Sixteen deaths, however, were due to floods in 1992, as opposed to none in 1991. Although the number of casualties decreased, significantly more people were affected by lahars and floods in 1992 than in 1991. A total of 33,400 families, or 159,939 persons, suffered the effects of lahars or floods in the first year (Department of Social Welfare and Development, 1992). In contrast, five times more families (164,191) and persons (802,742) were victimized by the end of August in the second year (Department of Social Welfare and Development, unpub. Disaster Monitoring data, September 28, 1992). The marked increase in the number of people affected was due primarily to massive lahar-induced floods in 1992. Viewing the data by type of hazard reveals that 144,259 families experienced floods in 1992, while 19,932 families were affected by lahars (table 4). Table 3. Municipalities that were flooded, or isolated by flooding, as of late August 1992 (shown by asterisk) or October 1, 1992. Table 4. Distribution of affected families, listed by province and type of disaster. At least 3,140 houses were completely destroyed and 3,072 were seriously damaged in 1992. Of the former category, 54 percent were demolished by lahar and the rest by floods. These data are principally for Pampanga; additional houses were destroyed in Tarlac and Zambales. A discussion of the effects of lahars and floods on people is not complete without mentioning damage to infrastructure and agricultural lands--damage that has profoundly affected livelihood and quality of life. Lahars inundated 15 km of roads, damaged 13 major bridges throughout the 1991-92 period, and threaten to affect another 10 bridges in the coming years (Department of Public Works and Highways, 1992b; Environment Management Bureau, 1992). Mudflows also breached 58 km of river dikes, half of which were along the Pasig-Potrero River. Lahars and floods affected as much as 42 percent of the total cropland of Pampanga, Tarlac, and Zambales. By province, Tarlac had the highest percentage of its cropland damaged (52 percent of 841 km2), followed by Pampanga (41 percent of 618 km2) and Zambales (13 percent of 236 km2) (Department of Agriculture Region III, unpub. data, 1992). In 1991, almost 9 out of 10 lahar-affected agricultural areas were planted to rice (Task Force Pinatubo, 1992). In 1992, that ratio remained practically the same; only a slight shift occurred toward sugarcane (Department of Agriculture Region III, unpub. data, September 28, 1992 Summary of Damage Report). This observation also holds for agricultural lands inundated by floods. They were overwhelmingly rice based. Because floods induced by lahar deposition in river channels usually left a layer of mud in their wake, farmers in affected rice-producing areas had to rehabilitate their lands. Beyond their direct effects on agricultural lands, lahars and floods affected 5 national and 176 communal irrigation systems that serviced 483 km2 of farmlands and 25,476 farmers (Task Force Pinatubo, 1992). The latter figure includes many whose lands were spared from either lahars or floods. In terms of the people associated with the land, a total of 11,540 farmers in Pampanga, Tarlac, and Zambales were affected by lahars in 1991. During this year, 85 percent of them were almost equally distributed between Pampanga and Tarlac. In 1992, however, the number of lahar-affected farmers declined by half, a finding consistent with the drop in the area of croplands newly affected by lahars. Farmers in those areas covered with 7 to 15 cm of lahar were better off than their counterparts in places with more than 15 cm but less than 30 cm of mud. The land of farmers with 15 cm or less of lahar just needed to be plowed, while the land of those with thicker lahar had to be scraped. Still other land was either buried beyond rehabilitation by lahar or sunk in emergent lakes, and those who farmed such land must look for alternate land or leave farming. Most of the affected farmers, especially in Pampanga and Tarlac, were land reform beneficiaries. Some are leaseholders, others amortizing owners, and still others are new owners who have fulfilled the state's requirement of land transfer. The loss of land owned through land reform, albeit temporary in a geologic sense, was a special blow to beneficiaries who have painstakingly paid in full and obtained legal ownership of their parcel of rice- or corn-producing lands. Among amortizing owners, those who have paid a significant amount of the cost of the land stood to feel the loss more than those who have defaulted on their payments. For the former residents of barangays devastated by lahars, the disaster mitigated an internal process of social differentiation. Prior to the calamity, the population in these villages was divided into those with access to agricultural assets or opportunities for overseas employment and those without. Lahars buried agricultural lands, equipment, and houses in these communities regardless of the wealth of the owner. In some instances, residents who were relatively well-off lost so much that they found themselves in positions similar to those who were once their social inferiors. It is in this sense that ordinary folks have referred to Mount Pinatubo as the "Leveller" or the "Equalizer." On the whole, however, class distinctions have not been eradicated, because many of those with financial resources managed to find new homes elsewhere. Residents who could not afford to go anywhere else were able to dig up housing materials, appliances, and furniture, thus preserving at least some of their position in the village's social hierarchy. Although the basic social hierarchy has been maintained in those communities whose residents have remained intact in relocation sites, some new organizations of community life have emerged in relocation sites populated by residents hailing from different barangays. In addition, the social distance among groups in places that have not yet been severely affected by the disaster has been bridged by a significant increase in communal activities that have cut across classes. Religious rituals such as prayer sessions and processions around villages and along the river channels have been the most visible activities in different parts of central Luzon. The rituals have been conducted all year round, although they are practiced most frequently during the rainy season. Apart from religious rituals, participation in activities to protect barangays from lahars (such as sandbagging) or to protest government decisions designating particular areas as catch basins have been documented. The explorations of the Disaster Coordinating Council to use the Candaba swamp as a catch basin for lahar was met by strong opposition from residents living in several municipalities in Pampanga. In the summer of 1992, the Department of Public Works and Highways planned to make a sediment-trapping "sabo" dam in Maskup along the Sacobia River to contain lahars that were expected to flow into some parts of Mabalacat, Pampanga. Residents of this municipality resisted the plan, fearing that it would divert lahars to other parts of the town. Some of those interviewed claim that a few residents threatened the contractors who were beginning to survey the area. As a consequence, the plan was shelved. The national government was not the only target of protests from angry residents who perceived efforts to protect some localities to threaten their own. Municipalities were pitted against each other as attempts to protect one political territory were deemed to be at the expense of a neighbor. The sandbagging operation along the boundary of San Fernando and Bacolor, Pampanga, is a case in point. The latter's folks rejected the fortification efforts of the former because it will trap lahars in Bacolor (Daily Globe, September 16, 1992, verified by the author from key informants). San Fernando's local officials were also caught in a dispute with those from Santa Rita, Pampanga. San Fernando officials were alleged to have asked the local court to stop residents of Santa Rita from putting up a sandbag dike, lest the dike divert lahars and floods into San Fernando, Pampanga's capital (Philippine Star, September 25, 1992; Philippine Daily Inquirer, September 25, 1992). The provincial governor's mediation apparently led to the withdrawal of the suit on the same day. The politics of lahar defenses also resulted in tension between neighboring communities. Sometimes, rumors were an outlet for the growing suspicion among neighboring barangays. Key informants in one municipality, for instance, cited ill will aroused by the differential impact of lahars on two sides of the river within that municipality. Those on the side that was spared were suspected of having breached the dike on the affected side. While such an operation would have been impossible to achieve without the affected area knowing about it, the impression held sway. The fact that dike construction raised ill will reflects the extent to which lahar defense has become a highly politicized issue. A political culture in which the powerful are able to get away with practically anything, especially in rural areas, accounts for much of the cynicism and suspicion with which efforts to defend human settlements are viewed. A cursory review of the graffiti on walls of abandoned homes reveals the angry and plaintive expressions of victims who, despite early warnings from the Philippine Institute of Volcanology and Seismology (PHIVOLCS), were caught off guard. Nothing in their individual and collective past prepared them for the disaster. As such, many of the victims suffered from psychological problems even long after their initial evacuation. But whether it came by day or night, the sound and sight of the lahar was enough to frighten the people into immediate escape. The lahar was terrifyingly high and steaming hot, they reported. It swept along with it tree trunks and rocks so huge and heavy that it took five men to move them later on. Many believed it to be the end of the world and all thought they would die then. All thought of immediate escape. There were those who only had time to scoop in their infant children and run off, all the while shouting to their older children to run ahead. (Few) had enough time and presence of mind to scoop up ... belongings. There was pandemonium as they ran, they recalled. People were screaming and crying as they ran, calling on their God for help and deliverance. Everyone was terrified and shouting for help. In their haste, they tripped or ran into each other, fell, picked themselves up and begun to run blindly again...there was a mad rush to get on the trucks. The women and children came off badly in this scramble, as they were pushed aside or thrown unceremoniously on. Those who were caught in their houses only had enough time to rush up to their roofs. There, families huddled together in fear and for comfort--awaiting their certain death. All spent the night terrified, crying, and praying to God for help and mercy ...."
Jimenez (1993) also reported several symptoms of stress among the victims who evacuated to the centers. Upon arrival in the evacuation sites, they trembled from cold and fear continuously. Some went into hysterical laughter. Even days later, victims found it difficult to sleep and did not have much appetite for food. Some of Jimenez's respondents judged that the Mount Pinatubo disaster affected males and females differently. Males tended to become more quiet and withdrawn than did the women, and spent time in all-male drinking sessions. More than a year after their lives were uprooted, service providers in a relatively well-established resettlement site for farmers in Zambales cited sudden bouts of crying, irritability, and constant headaches among the resettlers, which could only be traced to the trauma of Mount Pinatubo. Symptoms of stress were not confined to those who left their homes. For those living along the potential corridors of lahars and floods, the monsoon season heralded sleepless nights, with families anxiously awaiting the warning to flee their homes. So intense was the stress that when the warning signals--church bells or successive gunshots--were raised, key informants reported incidents of residents who suffered from heart attacks. Many of the psychological problems confronted by those who took flight from the perils of lahars and those who continue to live in natural catch basins could be attenuated by mass resettlement to areas that are not vulnerable to the disaster. Unfortunately, snags in the resettlement process and attachment to their original lands and homes have discouraged many would-be settlers from moving to resettlement areas. To the dismay of scientists who warn against remaining in danger zones, many of the potential victims have chosen to remain in high-risk areas because they have no viable alternatives. As noted earlier, the Mount Pinatubo disaster has displaced tens of thousands of people in Tarlac, Pampanga, and Zambales. A conservative estimate based only on the population of 29 most thoroughly buried barangays in 1992 is around 53,000 people, a figure that is bound to increase in 1993. The U.S. Army Corps of Engineers Recovery Action Plan team projected in a briefing for the Mount Pinatubo Commission that about 1,900 km2 of land in the three provinces may be buried beneath 2 m of lahar debris. The study, which basically supports the PHIVOLCS projections, prompted the commission to estimate that about 74,000 residents in the high risk areas could no longer be defended against lahar and might have to be evacuated by force (Mount Pinatubo Commission, 1993). These people, who were not victims during the 1991 and 1992 rainy seasons will add to the 53,000 dislocated victims. Because of the scale of human displacement, the state poured massive financial resources into the development of various resettlement projects. Total expenditures during 1991 and 1992 were at least P2.5 billion (US $93 million) for evacuation and resettlement sites (Mercado and others, this volume). In addition, various civic groups, private relief agencies, and development-oriented nongovernmental organizations in some of the state's resettlement sites also infused private resources into these efforts. The Loob Bunga Resettlement Site in Zambales, for instance, stands out in terms of its private resources. At least 11 organizations extended food assistance, provided health and nutrition services, and promoted livelihood projects, as well as literacy and spring-water development projects. An ongoing controversy over the state's resettlement efforts boils down to differences in the basic approach to the problem of resettlement. From the perspective of a technocrat, resettlement requires technical planning based on the principles of scale and efficiency. The logic underlying the technocratic perspective of the now-defunct Mount Pinatubo Task Force can be described as follows. The infrastructure and settlement patterns of some modern cities in the world were planned at critical junctures in their history. The present Tokyo, for example, developed from the ruins of the Great Kanto earthquake of 1923 and from the Second World War. While these calamities resulted in untold human misery, they also provided the occasion to plan the modern Tokyo. Because the Pinatubo disaster dislocated tens of thousands of victims, the technocrats hope to address victims' needs while maximizing the rare opportunity to use planning principles. Their idea is to put up settlements bigger than the usual barangays in order to economize on basic services like schools, public markets, and hospitals. The concept for the physical layout of the envisioned towns drew from the sprouting subdivisions in Metro Manila and its suburbs, the plaza complex found in most towns, and ideas about the practicality of grid road networks versus the current linear pattern in rural areas. In addition, because government will be building new towns anyway, the Mount Pinatubo Task Force's logic dictates that they might as well fit into the Regional Spatial Development Strategy of central Luzon. This strategy conceives Region III to be the transit lane between the resource-rich provinces of northern Luzon and the densely populated industrialized areas of Metro Manila. As such, central Luzon will "serve as a catchment area for population and industry spill-over from the metropolis, while maintaining its comparative advantage in agriculture in some places." The plans also project the region in the role of "providing the requirements of the Northern Luzon provinces in terms of processing and manufacturing of goods and their eventual shipment to areas of destination" (Mount Pinatubo Task Force, 1991). The overall technocratic vision explains why new resettlement areas have gridded street systems, modern public buildings clustered around a plaza, productivity centers (large buildings intended for use as factories), and uniform houses made of either hollow concrete blocks or nipa (a palm). However, these complexes have attracted much negative attention. Some critics are silent on the basic approach but object to aspects of the content or implementation of the program; other critics question the basic philosophy and the implementation of the plans. The first group of critics accepts the technocratic planning process but assails the state for its insensitivity to the plight of central Luzon's dislocated residents. Site development has been deemed too slow in the face of victims who have languished in evacuation centers for more than a year. In the case of O'Donnell, Capas, Tarlac, the most developed of the sites, millions of pesos had to be advanced by a cooperative headed by a private citizen to hasten the pace of its development. Apart from the speed, the phasing of the project has also been questioned. Cemented roads and public buildings were put up before houses. To make matters worse, livelihood development efforts were relegated to the background, so some who moved into the resettlement areas decided to leave and others hesitated to move in. On the whole, these criticisms do not question the plaza complex or even the construction of public buildings as long as these are done after housing and livelihood needs are met. The second group of critics questions not only the content of the plans but also the spirit and process of planning imbedded in them. Drawing from the principles of participatory development, these critics stress the importance of planning with and not for the affected people. In this approach, victims should participate actively in all stages of planning. The participation of would-be resettlers is crucial for practical and psychological reasons. Victims will make sure that projects will meet their needs, and they will feel a pride of ownership. The resulting houses and emergent communities may not conform aesthetically to the technocratic vision, but they will be houses and a community in (and for) which the displaced families will work hard and succeed. Psychologically, the process of participation is as important as the visible outcomes of collective decisionmaking, because it enhances the self confidence of individual victims and the community's collective confidence in being able to rebuild its life in the new site. The criticisms emanating from proponents of participatory development have two implications for resettlement. There can be no uniform design or blueprint for resettlement sites. This means some of the basic parameters in terms of sites can be set at the national or regional level, but the conceptualization of plans will have to be decentralized to the level of the communities involved. The second implication is that community organizational efforts must be an integral part of the resettlement process. It is easy enough to give lip service to community organizing, but it is hard to find capable people who have internalized the spirit of participatory development. Case studies of resettlement sites by the nongovernmental organization (NGO) Philippine Business for Social Progress, for instance, reveal that some NGO's that are committed in principle to participatory development encounter problems of finding enough good organizers. Meaningful and effective decentralized planning requires coordination with local and regional government agencies and NGO's. For all the criticisms hurled against the state in the last 2 years, it is the only institution that can mobilize all of the basic resources needed in resettlement work. Only the state is in a position to officially allocate land from the public domain and negotiate with private owners. Infrastructural works such as roads, power, sanitation, and schools are also better left with government. Coordination with and among government agencies is necessary to speed up the process of resettlement. This is easier said than done. Even under a centralized scheme, conferences on relief and rehabilitation have been haunted by a recurring complaint--that government agencies continue to function within their own turfs. As such, the disaster-related programs have been far from integrated (Bonifacio, 1992). NGO's also have problems of duplicated effort and lack of communication. Key informants claim that very little is done to coordinate services rendered. Furthermore, when collaborative decisions are reached, there are no mechanisms for carrying them out. In their book based on the lessons learned from disasters in different parts of the world, Anderson and Woodrow (1989) cautioned against too much stress on NGO coordination. Although they argue for coordination of services, they raise basic questions. Who is in charge of coordination? Whose purpose does it serve? Is it intended to ease the work of NGO's and make logistical requirements run smoothly or is it to ensure the highest possible involvement of the victims in decisionmaking and planning? Underlying the abovementioned questions is an argument for integrating disaster-related work with long-term development goals. If enhancing the capacities of victims and reducing their vulnerabilities is not kept in mind by development workers at every point of the rehabilitation and resettlement process, then well-intentioned attempts to improve coordination will merely add to a host of other emergency efforts that defer long-term development to the future. In debates over models for development, all agree that the creation of economic and social structures, while necessary, is not a sufficient gauge of development. Over the long run, external agents cannot ensure a people's well being; only the people themselves can do that, by increasing their capacities and reducing their vulnerabilities. Given the demands of ministering to the daily requirements of rehabilitation or resettlement, even the more development-oriented NGO's and committed government agents may fail to see how their humanitarian work can stifle the capacity of the victims to rise from the ashes. As their short-term emergency assignment becomes institutionalized in the field, they may be insensitive to the incipient dependence developed in the victims who are unwittingly made to rely on external agents for their needs. Many of those involved with redevelopment around Pinatubo realize the dependence they have inadvertently created in the course of their work. NGO's operating in the Loob Bunga Resettlement site are themselves alarmed by the perpetuation of a culture of dependence and mendicancy among resettlers (Mondragon, 1992). While they all agree that food for work programs will have to end, they are prevented from focusing on rehabilitation by a lack of opportunities to sustain livelihood projects in the site. The original concept of the new resettlement towns assumed industrial development in the central Luzon region. The planners hoped that multinational and domestic investors would see the prospect of employing resettlers in the newly built productivity centers. However, the uncertainty over the landscape of central Luzon in the next few years and the sluggish nature of overall Philippine economy has, to date, prevented investors from risking their fortunes in these centers. Naturally, concerns about livelihood have slowed acceptance of resettlement. Respondents to a survey by the Philippine Business for Social Progress (PBSP, 1993) revealed that most respondents gave livelihood a higher priority than housing. The relative absence of income sources in the resettlement sites accounts for the refusal of would-be settlers to move to the new sites. It also explains why some of those who moved in earlier have already left the sites. The fact that some displaced victims have returned to their old homes has led the NGO's in Zambales to seriously consider internal repatriation. Supporters of repatriation point out that some of the victims who decided to stay put in their barangays at the height of the evacuations seem to have rebuilt their lives faster than anyone in the resettlement sites. It may be possible for some to return to their old homes during the dry season and to go to the resettlement sites when the rains begin. It may also be possible for some victims to evacuate to sites near their original barangays rather than to the resettlement areas. The eruptions of 1991 and their muddy aftermath have taken an enormous toll on the people of central Luzon. Fewer than 1,000 lives have been lost, but more than 200,000 families and more than a million people have suffered some loss or dislocation as a result of ash fall, lahars, or flooding. Of these, barangays that were home to 9,800 families (53,000 people) were so severely buried or otherwise damaged that they have been virtually abandoned. Large areas of agricultural land have been covered, some beyond immediate rehabilitation, and additional areas have lost their supply of irrigation water. Current victims of the Pinatubo disaster have not yet seen the end, and many others are still potential victims. The next several years will continue to bring untold misery to central Luzon. Those who are presently dislocated, and those who will be dislocated in the next several years, need resettlement options that provide livelihood and that facilitate psychosocial adjustments to the trauma of being uprooted. The task is urgent, because people in high-risk areas will agree to move away only if there are viable alternatives. The paper condenses the findings of a multidisciplinary team under the sponsorship of the College of Social Sciences and Philosophy, University of the Philippines--Centre for Asian Studies, University of Amsterdam. Anderson, Mary, and Woodrow, Peter, 1989, Rising from the ashes: Boulder, Westview Press, and Paris, UNESCO Press, 300 p.
Bautista, Cynthia Banzon, ed., 1993, In the shadow of the lingering Mt. Pinatubo disaster: Quezon City, College of Social Sciences and Philosophy, University of the Philippines Faculty Book Series No. 2, 291 p.
Bonifacio, Manuel, 1992, Disaster in agriculture: A framework for an innovative approach to agricultural resources management for Region III: Paper presented to the Farming Systems and Soils Research Institute, College of Agriculture, University of the Philippines at Los Banos. Department of Public Works and Highways, 1992a, Mt. Pinatubo Infrastructure, Rehabilitation, and Reconstruction Program': Paper presented at the International Scientific Conference on Mt. Pinatubo, May 27-31, 1992, Department of Foreign Affairs, Building, Manila, 35 p.
------1992b, Mt. Pinatubo Infrastructure, Rehabilitation and Reconstruction Program: Manila, unpublished report of September 15, 1992, 29 p.
Department of Social Welfare and Development (DSWD), 1992, DSWD and relief operations: Paper presented by the DSWD Secretary at the International Scientific Conference on Mt. Pinatubo, May 27-31, 1992, Department of Foreign Affairs, Manila, 12 p.
------1992b, Consolidated report on flashflood/lahar: Manila, Department of Social Welfare and Development, Region III, September 28, 1992. Environment Management Bureau, Department of Environment and Natural Resources, 1992, A report of the Philippine environment and development: Issues and strategies: U.N. Conference on Environment and Development, Rio de Janeiro, Brazil, 260 p.
Jimenez, Maria Carmen, 1993, Stress and coping in difficult times: a study of evacuees and service providers in Concepcion, in Bautista, C.B., ed., In the shadow of the lingering Mt. Pinatubo disaster: Quezon City, College of Social Sciences and Philosophy Publications, Faculty Book Series No. 2, p. 131-162. Lubos na Alyansa ng mga Katutubong Ayta ng Sambales (LAKAS), 1991, Eruption and exodus: Quezon City, Claretian Publications, 122 p.
Magboo, F.P., Abellanosa, I.P., Tayag, E.A., Pascual, M.L., Magpantay, R.L., Viola, G.A., Surmieda, R.S., Roces, M.C.R., Lopez, J.M., Carino, D., Carino, W., White, M.E., and Dayrit, M.M., 1992, Destructive effects of Mt. Pinatubo's ashfall on houses and buildings [abs. ]: Abstracts, International Scientific Conference on Mt. Pinatubo, May 27-31, 1992, Department of Foreign Affairs, Manila, p. 22. Magpantay, R.L., Abellanosa, I.P., White, M.E., and Dayrit, M.M., 1992, Measles among Aetas in evacuation centers after volcanic eruption [abs. ]: Abstracts, International Scientific Conference on Mt. Pinatubo, May 27-31, 1992, Department of Foreign Affairs, Manila, p. 33. Mondragon, Gabriel, 1992, Resettlement and rehabilitation of Mt. Pinatubo victims: Problems and prospects for sustainable agricultural development. The Loob Bunga experience: Paper presented at the Symposium for Sustainable Agricultural Development of Mt. Pinatubo Affected Areas, National Institute of Biotechnology and Applied Meteorology, University of the Philippines at Los Banos. Mount Pinatubo Commission, 1993, Pinatubo News Highlights: Manila, v. 1, no. 3, April, 6 p.
Mount Pinatubo Task Force, 1991, Rehabilitation and reconstruction program for Mt. Pinatubo affected areas: Manila, Government of the Philippines, October 1991, 62 p.
------1992, Rehabilitation of Mt. Pinatubo affected areas, special transition report: Manila, Government of the Philippines, May 1992, 43 p.
Pardo de Tavera, M., 1992, Department of Social Welfare and Development and Relief Operations: Paper presented by the DSWD Secretary at the International Scientific Conference on Mount Pinatubo, Department of Foreign Affairs, May 27-31, 1992. Philippine Business for Social Progress, 1993, In search of alternatives for the Mt. Pinatubo victims, preliminary report: Manila, May 1993, 100 p.
Shimizu, Hiromu, 1989, Pinatubo Aytas: Continuity and Change: Manila, Ateneo de Manila Press, p. 6-14. Spence, R.J.S., Pomonis, A., Baxter, P.J., Coburn, A.W., White, M., and Dayrit, M., this volume, Building damage caused by the Mount Pinatubo eruption of June 14-15, 1991. Surmieda, M.R.S., Abellanosa, I.P., Magboo, F.P., Magpantay, R.L., Pascual, M.L., Tayag, E.A., Viola, Q.A., Diza, F.C., Lopez, J.M., Miranda, M.E.G., Roces, M.C., Sadang, R.A., Zacarias, N.S., Dayrit, M.M., and White, M.E., 1992, Mt. Pinatubo eruption: Disease surveillance in evacuation camps [abs. ]: Abstracts, International Scientific Conference on Mt. Pinatubo, May 27-31, 1992, Department of Foreign Affairs, Manila, p. 34. Tadem, E., and Bautista, C.B., 1993, Brimstone and ash: The Mt. Pinatubo eruption, in Bautista, C.B., ed., In the shadow of the lingering Mt. Pinatubo disaster: Quezon City, College of Social Sciences and Philosophy, University of the Philippines Faculty Book Series No. 2, p. 3-16.